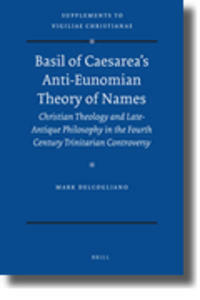 Basil of Caesarea’s debate with Eunomius of Cyzicus in the early 360s marks a turning point in the fourth-century Trinitarian controversies. It shifted focus to methodological and epistemological disputes underlying theological differences. This monograph explores one of these fundamental points of contention: the proper theory of names. It offers a revisionist interpretation of Eunomius’s theory as a corrective to previous approaches, contesting the widespread assumption that it is indebted to Platonist sources and showing that it was developed by drawing upon proximate Christian sources. While Eunomius held that names uniquely predicated of God communicated the divine essence, in response Basil developed a “notionalist” theory wherein all names signify primarily notions and secondarily properties, not essence.